Posted on behalf of the Uwingu team; Astronomy magazine is a proud partner of this effort to raise funding for space science. 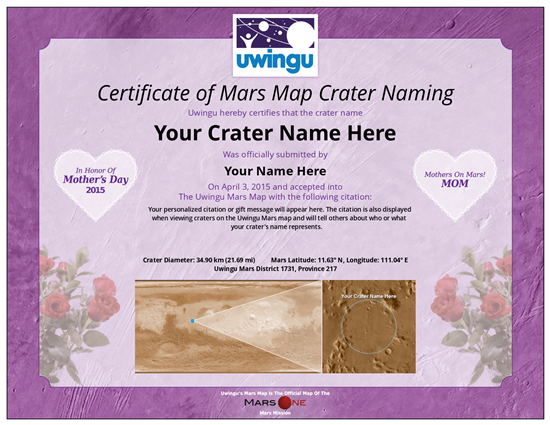 Space company Uwingu announced today a special campaign to honor moms for Mother’s Day with place names on its Mars map. Through Mother’s Day, Sunday, May 10, Uwingu is offering decorative Mother’s Day certificates for anyone choosing to honor a mom this celestial way. Two certificate options are available: either an electronic downloadable version or a beautifully printed and framed keepsake version. Uwingu’s Mars Map will be carried to Mars aboard the first Mars One robotic lander. Uwingu also announced that those purchasing the 50 largest craters named before Mother's Day 2015 will receive a 2­‐for­‐1 bonus: a gift certificate of equal value allowing them to put additional crater names on the Mars map for free anytime in 2015, including Father’s Day. Prices for naming craters depend on the size of the crater and begin at $5. Half of Uwingu’s revenues go to fund the Uwingu Fund for space research and education grants. Said Uwingu’s Ellen Butler, “I'm excited to name a crater on the Uwingu Mars map in honor of my biggest fan, my mother, at Mother’s Day. This will make a wonderful and really unique gift for her!" Uwingu’s Mars Map Crater Naming Project at www.uwingu.com allows anyone to help name approximately 590,000 unnamed, scientifically cataloged craters on Mars. Uwingu’s Mars map grandfathers in all the already named craters on Mars, but opens the remainder up for naming by people around the globe. Dr. Alan Stern, Uwingu’s CEO, added, “This is an out‐of­‐this­‐world way to honor moms across the Earth with a magical connection to the universe. Help your mom join our MOM club — the Mothers on Mars club!"